Maybe, one of the sweetest successes in hosting is when you become the guest. That’s what happened tonight when we brought our black bean cilantro salad over to the neighbors’ apartment who have enjoyed pancakes on so many nights. 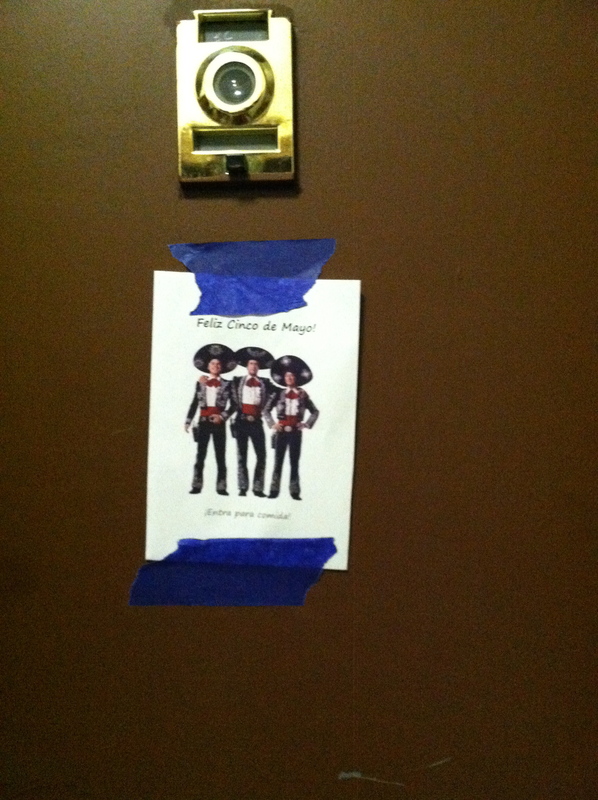 Patrick’s neighbors opened their door (with a clever invitation taped to the front) to a Cinco de Mayo feast they spread on their coffee table in their little NYC living room. I think we made community, this little pancake crew. Somehow, being a guest made it feel official. Our conversation was about things “we” do and games “we” should play together and other nights “we” should all host. Patrick’s apartment building missed him tonight, but while he was in Spain we were celebrating Mexico’s independence with the sweetest neighbors you could find. We were made for this – for campfires and coffee tables and kitchens. Two months from today I get to promise forever to the man who loves campfires, coffee tables, and kitchens in the very same, excessive amounts. That is a lot of handwritten notes on doors, a lot of pancakes, and a lot of side dishes sealed in tupperware containers. Not all of it is romance. Sometimes the recipes flop and sometimes the neighbors don’t show up and sometimes there isn’t enough bacon. But, thankfully enough, the requirement for community is persistence. Between the two of us, we have quite a bit of that (in between and in the midst of failures/successes). Still, the most precious necessity for community is persisting in knowing the One with the original idea. I kind of promise I won’t write every post about my engagement/wedding. But, I am hoping some of you readers cut me some slack because I only get to be in this stage for two months. You don’t mind, right? This entry was posted in anecdotes, Life Insight, Mondays, this is me, Thoughts. Tagged Christian community, community, Engagement, neighboring, potluck, the art of neighboring, wedding planning. of your much loved community. When will pancake mondays go live worldwide!? Yeun! We miss you like madness here!! I especially miss you during Spring because I know that you would make sure I stopped to appreciate the beauty in creation. There are so many blooms that serenade my morning commute – so, so many!